This is my seventh year participating in Ali Edwards' One Little Word. I started in 2011 with Balance (2011), then did Celebrate (2012), Try (2013), Enjoy (2014), Relax (2015) and Share (2016). Without exception, focusing on each of these words for a year has been very positive for me. My One Little Word for 2017 is Connect. I want to strengthen the connections with close friends and family, and reconnect with people I haven't seen in far too long. I want to build new connections within the blogging and crafting communities. I want to make connections with other parents as Trevor transitions from Cub Scouts to Boy Scouts and from elementary school to middle school this year. I want to do a better job of connecting with you, my readers, through my blog and social media. 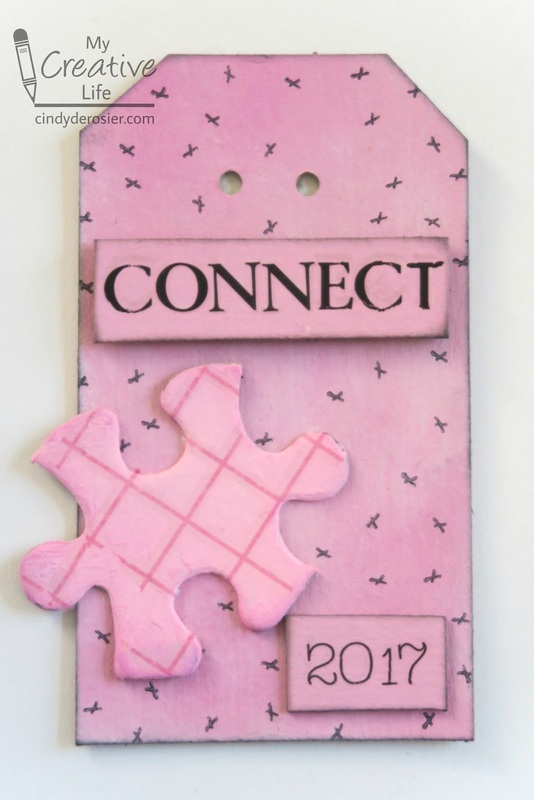 I thought a puzzle piece would be the perfect symbol for Connect, so I built this year's tag around that. 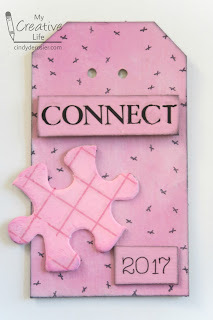 I'm not sure what made me choose eraser pink for my tag, but it's covered with little plus signs (actually, X's) to inspire me to make connections. Coincidentally, Connect is the same word that Ali picked this year. None of her previous eleven words match any of my six, so it's surprising that we chose the same one this time. As always, my new One Little Word does not replace the previous ones. Balance, Celebrate, Try, Enjoy, Relax and Share will be as much a part of 2017 for me as Connect. Here is Connect with all my other tags. Did any of you choose One Little Word for 2017? I'd love to hear what it is and why you chose it! Love your word! I need to connect more to the people in my real life! As an introvert I find I retreat into my shell a lot... that' snot good. Even though I'm not doing OLW, perhaps I can just keep that word in the back of my head for motivation?! I think you picked a great word! I'm still kind of sitting on a couple words until it feels right. I usually have a word right away, but this year has been harder for some reason. Just going to practice patience! That's a great word to add to your list. Cheers to another year of great connections!